China’s robust land reclamation, that includes turning tiny reefs into artificial islands and creating an airport infrastructure with a runway capable of launching military aircraft, have increased the tension and complexity of these conflicts. Citing a number of sources, “Recent Trends in South China Sea Disputes” sees China’s activities as a direct threat to freedom of navigation and over flight across the South China Sea. The report chronicles a long list of armed skirmishes that have included both aviation and maritime collisions. The report is the work of Minh-Vu Truong, member of Boston Global Forum’s (www.bostonglobalforum.org) Young Leaders Network for Peace and Security and Director of the Center for International Studies of Ho Chi Minh University of Social Sciences and Humanities; Trang Pham, the Nippon Fellow at the International Tribunal for the Law of the Sea (ITLOS); and Richard Javad Heydarian, Assistant Professor at De La Salle University and Policy advisor at the Philippines House of Representatives. Boston Global Forum is a think tank cofounded in 2012 by Former Massachusetts Governor Michael Dukakis and Tuan Nguyen, who is credited with opening up Vietnam to the Internet. According to, “Recent Trends in the South China Sea Disputes,” misinformation, misperception and mismanagement by each country involved colntribute to the tension. The authors recommend production of a South China Sea (SCS) Threat Index and SCS Monitor to increase transparency. The SCS Monitor and SCS Threat Index will assess maritime security and regional stability in the South China Sea region and provide an objective platform for academic and policy debate over priorities needed to strengthen security, and to encourage governments and the international community to take appropriate actions to reduce the risk of armed conflict. Based on specific indicators, the indexes will monitor the balance between peace and conflict and publish the current security-status of the South China Sea in a quick-to-grasp format. 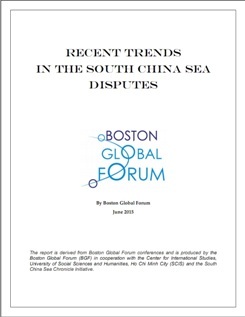 As part of the effort to ease world tensions, Boston Global Forum held several live and online international conferences and symposia focusing on practical solutions over claims in the South and East China Seas. Participants included leaders in business, government, academia and the professions who are interested in global peace and economic security. Established in 2012, Boston Global Forum brings together, in an open and accessible public forum, an eclectic and engaging spectrum of highly regarded academic leaders, real-world experts, influential thoughts leaders, and promising young leaders.